“Elite” group founded on 14th of August 1983 is a group of technically & professionally qualified technocrats having over 25 years of experience in the field of design, manufacture, after sale services & marketing of steam boilers, thermic fluid heaters, hot water generators, hot air generators, fluid bed dryers, and a full range of other allied process heating equipments. We have standardized designs as well as the capability to manufacture custom engineered products to meet certain specific requirements of customers. Our manufacturing facility is located at Shirwal (Satara District) near Pune – Bengaluru National Highway NH 4, India. It has IBR (Indian Boiler Regulations) License certification. About 80% of our regular business is through repeat orders received from our existing customers growing their businesses, which justifies the faith shown by them in our products’ quality, excellent performance, reliability & prompt & reliable after sale services provided to them. We are a quality conscious company; quality is always on the top of our priority list. This clearly indicates our commitment towards emphasizing on imparting precision engineered process heating equipments. Our engineers and allied technicians put their whole effort in the production procedure; apart from this we have employed adept quality controllers in our organization. These quality controllers keep strict vigilance over the entire production and undertake various quality tests on the basis of different technical parameters. Further, our quality controllers pay attention to each and every quality aspect of the product and keep strict vigil over the ready to order assignments. They also make sure that each consignment is properly packed for safe and secure transit to the customers’ end. 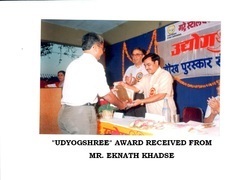 Udyogshree Award received by our Founder; Late Mr. Dilip Atre from the then Minister of Industries, Shri Eknath Khadse. 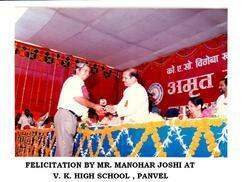 Felicitation of our Founder; Late Mr. Dilip Atre by the then Chief Minister of Maharashtra; Shri Manohar Joshi. We are well supported by a highly competitive team of professionals that enables us to carve a niche in the industry. Our diligent professionals work in close collaboration with each other to offer quality industrial steam boilers, thermic fluid heaters, fluid bed dryers to our clients. Our technocrats are experienced and have immense knowledge in the related field. Our team members are from technical background and have rich experience in the related fields. We have competent engineers offering efficient after sales support to the clients for our industrial chemical reactors, industrial oil heaters, industrial hot air generators, industrial fluid heaters etc. Our skilled workers are consistently working while giving prime importance to innovation, development, quality and service to customers. As we follow a systematic marketing strategy, we are able to achieve 100% customer satisfaction. Our range of industrial steam boilers, thermic fluid heaters etc. is always appreciated by the clients for their various features. Owing to our high quality standards of the products, we have some of the prominent names as our clients across the globe. To become a leading global organization in the field of industrial thermal equipments. To design, manufacture, supply & provide technical support for industrial thermal equipments confirming to certain specific quality standards & principle of energy conservation with an ultimate aim to achieve total customer satisfaction.